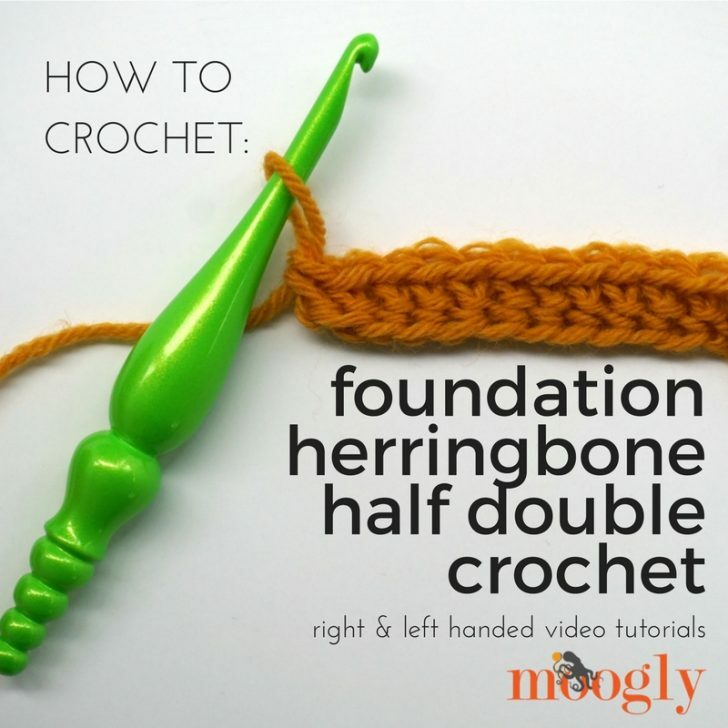 Foundation Herringbone Half Double Crochet - Video Tutorials on Moogly! The Herringbone Half Double Crochet stitch is getting noticed – and maybe even improved! 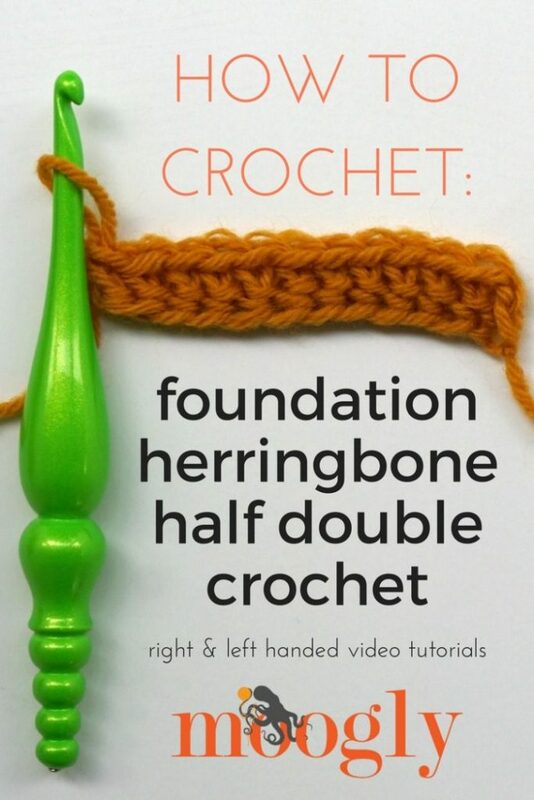 Here’s how to crochet the Foundation Herringbone Half Double Crochet stitch! The Herringbone Half Double Crochet stitch (hhdc) is a fun alternative method of crochet hdc stitches that creates a significant lean and an interesting look. And like most stitches, a project made with hhdc is usually begun by working into a chain. But it doesn’t have to be! You can work Herringbone Half Double Crochet stitches in Foundation style – making the chains and stitches for the first row at the same time. Here’s how! First Stitch: Ch 2, yo and insert hook in first ch made (furthest from hook), yo and pull up a loop, (yo and pull through 2 loops on the hook) twice. Additional Stitches: Yo and insert hook under two loops at bottom of previous stitch, yo and pull up loop, (yo and pull through 2 loops on the hook) twice. Now, at a glance this can look a lot like Foundation Double Crochet stitches. But much like going from dc to hdc, there’s actually one dropped step. When making a Foundation Herringbone Half Double Crochet, the first loop pulled up acts as the chain. It’s this stitch you go into to begin each subsequent stitch. Then, with 3 loops on the hook, you yo and pull through the first two loops, then yo and pull through the last two loops. If it were a Foundation Double Crochet stitch, there would be another yo and pull through in there before you yarn over and pull through the first two loops. Click the link above and watch the two videos to compare if needed! 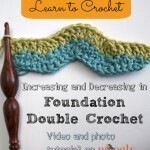 So that’s how you crochet the Foundation Herringbone Half Double Crochet. After the first row is made, then you switch back to the standard Herringbone Half Double Crochet stitch – or whatever stitch your pattern calls for. I hope this video has helped you understand how to apply foundation crochet techniques to the HHdc stitch. If it has, please share it with your crochet friends! i really love the was you present your video’s they are very helpful., i always use them, and i do not have to guess at what i see. please don’t stop. Wow, thank you so much Sandy! I really appreciate your saying so. I love herringbone stitch and use it a lot for mitts and hats as it’s denser than half and double crochet and stretchy – ideal Thanks for this tutorial, maybe I’ll try it across instead of in the round. I’m curious when making the foundation chain, why you never pull a loop through as you do normally in the HHDC. In the instructions for a regular HHDC, after you yarn over and pull through the first time, you then pull the loop through the next loop. But in the foundation it seems to skip that step.